Originally published in 1925, this book embodies the results of research on red-green colour-blind subjects, supplemented by brief accounts of blue-yellow, total, and acquired colour-blindness to complete the description of the different forms of the defect. 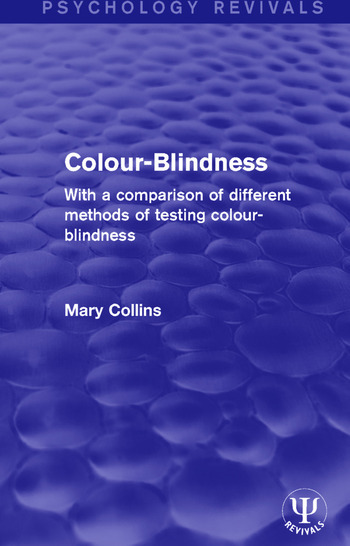 After a historical survey of previous work by such men as Dalton, Helmholtz, Rayleigh, Edridge-Green and others, the author deals with the most important theories of colour-blindness, and with a description of the tests and a discussion of their results. Preface. Introduction by Dr James Drever. 1. Introductory – Brief Historical Survey 2. Colour Theories with Special Reference to Colour-Blindness 3. Description of Tests and Discussion of Results 4. Tests and Results (continued) 5. Tests and Results (concluded) 6. A Brief Diagnosis of the Individual Cases 7. Concluding Remarks. Bibliography. Index.